There are lots of ways to get around New Zealand. So far I’ve only really talked about traveling with other travelers who have bought a car, buying one yourself, or renting a car. But there’s another way: Hitching a ride with a local! Some travelers search for ride shares around New Zealand using online listings like Carpoolnz or Catchalift. I have tried this before without much success. Hitchhiking better suits the spontaneity of the on-the-go travel lifestyle and it can be a safe alternative if done cautiously. The best part is the potential to connect with friendly locals. 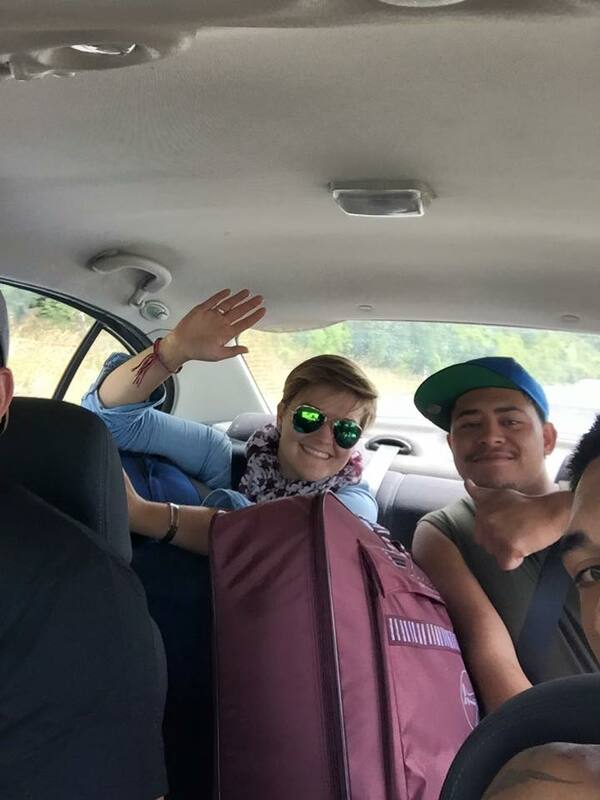 For example, I was lucky enough to get a ride from a few locals on my way to Christchurch for my second house-sit. Even better, they were not only locals but Maori descendants—the native people of New Zealand. I love talking to and hanging out with all kiwis, but these are a special group of people who have a culture all their own from a time long before Europeans arrived on the shores. Let’s be real about this; Hitchhiking is not something you want to be doing just anywhere. Especially for a woman traveling alone, hitchhiking is out of the question in most parts of the world. New Zealand is one of the safer countries in which to hitchhike. I met many hitchhikers in my travels, including many solo females who swore by the amazing friendliness of the locals who picked her up. While hitchhiking is legal in New Zealand, the New Zealand police suggests “hitchhiking is dangerous.” Well, yes, so is driving on the left side of the road as a foreigner in New Zealand. Meanwhile, New Zealand has seen less than 10 hitchhiking related deaths since 1975. Nobody wants to be a statistic in either of these cases. You can keep yourself safe from your own lack of experience by refraining from driving New Zealand roads. Simultaneously, you can make hitchhiking a safer activity with a few precautions in place. For those looking to deviate the norm a bit, meet potentially interesting people you otherwise would not, and have a bit of an adventure, here are some tactics I used to increase my chances of finding and experiencing a safe ride. Don’t tell them where you’re going before you have a chance to judge the driver. Don’t put your belongings in their trunk or back seat. Keep them next to you or on top of you. Your belongings can act as a shield against any threats or, in a really sticky situation, a shield against the pavement for a quick dive out of the car. Keeping your stuff on you also decreases the chances for your belongings getting stolen. Probably one of the biggest risks (beyond a physical attack) is a driver speeding away with your belongings before you have a chance to retrieve them! Do tell a friend you will be hitch hiking. Tell a friend, especially someone you know from the country you’re visiting, where you’re hitch-hiking to and from and when. Take a photo of their license plate numbers and send it to your friend. Better yet, let your driver know you have someone who is looking out for you and ask them if you can send their license plate numbers just to be safe. Even if you’re feigning all of this, it may be enough to dissuade any potential threats to you or your belongings. Don’t feel awkward about mentioning any of this—a truly friendly driver will gladly support your efforts to be safe. Do have your ride drop you in a public location. If you have the option, try to get your driver to drop you off where there are lots of people around. There’s less chance of something going awry in the last few minutes if there’s lots of people walking and driving by the car. On that note, wait for your ride in a busy, public location (you’ll also be more likely to get picked up!). I personally advise taking safe and reliable forms of transportation as much as possible—especially if you can afford it. But for the adventurous deviators out there you can have some great experiences and meet some wonderful people while hitch-hiking with the above precautions in place. So yes, I hitchhiked. I was afraid to do it, but this made it all the more important for me to try. My fear also gave me the foresight to be cautious, not let my guard down, and enact the safety measures I outlined above. I was heading from Picton to Rangiora just north of Christchurch. I planted myself just outside of town with my bags at my feet, a big smile on my face, and an extended thumb. Many cars went by, some shrugging their shoulders at me as if saying sorry they couldn’t help on this occasion. Only 10 minutes passed when a sedan pulled up with 3 mocha-skinned young men peering out of their windows at me. I have to admit, this was a bit of an intimidating sight at first glance. But then I saw a guitar in the back seat and the wagon they pulled behind the car with a Maori hangi (oven) on it. I made the quick judgment these were a bunch of friends or family on holiday together. I asked where they were heading. Christchurch. They were happy to give me a ride to Rangiora. After another glance around the car, I decided it felt alright. They offered to put my bags on the wagon in the back, but I declined. I snapped a photo of their license plate and then piled into the back with all my belongings on top of me. After texting Jonathan (my friend in Napier) all the details of my ride, I asked them if they had Maori ancestry. Yes, they were all part Maori. According to them, most Maori nowadays are part Maori and part European. For instance, Les, the foreman I met on the ferry to Picton, is half Maori and half Norwegian. Maori culture can be seen embedded in New Zealand society everywhere you go. Maori names of towns—like Matamata and Whanganui—and information about historic battles and spiritual landmarks exist all over the country. The Te Papa museum in Wellington features a huge section on Maori history, European colonization, and information on all the treaties and politics emerging from their entanglement. Maori arts and crafts including their iconic human figure with the protruding tongue appears in wood carvings and sculptures all over. While respect to their history and pride in their cultural presence was felt everywhere, for weeks I had simultaneously been hearing many stereotypes and discriminatory opinions about Maori people. Everything from them being lazy and irresponsible to being welfare opportunists and drug addicts. As a social psychologist, I am trained to be skeptical of quick assumptions and stereotypes about social groups. Only being in New Zealand for over a month, I hadn’t yet had the opportunity to talk to Maori people about their own perspectives and experiences. Their names were Sam, Lenoel, and Bowen. They were all in their early- to mid-twenties. It was just after New Years and they all were heading back to start working again after being on holiday for a couple of weeks. They enjoyed their jobs and working hard. They were sad their holiday was ending but looking forward to getting back to being productive after their holiday. I asked them what stereotypes they had heard about Maori people and what they thought about them. They disagreed with the assumptions they are all lazy and drug addicts, stating only a small percentage give the rest of their group a “bad name.” Often the small percentages who represent the stereotypes are stigmatized out of context or a clear understanding of their perspectives. They wished people would speak more about the positive aspects of their culture. For example, one prominent cultural value is viewing all others as whanau (“family”). They value welcoming others and giving great hospitality even to strangers. From my experience so far, I couldn’t agree more! Hanging with these guys was sweet as! They asked for nothing of me in return other than my company (although I did share the foreman's toffee pops with them!). They told me they had never picked up a hitchhiker before. I asked them why they did this time and they said, “Oh just to mix things up a bit. It’s been the 3 of us this whole trip!” Seems they were interested in deviating the norm like me! Sam went on to tell me they picked me up because I looked like a safe person to invite into their car. Of course! I thought. Safety is a concern from both ends of the hitch-hiking adventure. Even three tough-looking Maori guys had their concerns. In the end, I’m glad I tried out hitchhiking and I’m glad this friendly group of guys shared their extra seat and insight into their culture with me. If they're reading this, chur bros!